If there is one color that sums up fall, it has to be orange. Pumpkins, Halloween, leaves, it screams fall. Now, I know what you’re thinking – “Carla, your tiramisu isn’t orange. It’s…BROWN.” Well I wasn’t expecting the Pumpkin Tiramisu to turn out as brown as it did. I was thinking oh the pumpkin filling will be orange! As soon as I added the cinnamon and clove, all hopes of orange were lost. I didn’t even have an orange tablecloth or fake pumpkin, just a lonely little orange napkin. I even covered it with (brown) Pumpkin Butter Caramel Sauce. Well….at least the lighting makes it look elegant? If you were here back in June for #strawberryweek, you may remember the disaster of Strawberry Tiramisu. I failed at making homemade ladyfingers. Twice. Then I couldn’t find premade ladyfingers at the store. Then I couldn’t find mascarpone. And on top of all that, I was sick. After Dad saved the day with ladyfingers, I had half a package leftover. I knew I wanted to tackle tiramisu again when I was better. Once I found mascarpone at the store, I grabbed it. Then it sat in my fridge for about two months. Whoops. When Pam, our lovely host this week, announced the theme, my mind immediately went to the Pumpkin Tiramisu recipe I had bookmarked for awhile. Not only would it fit the theme, I could finally use up those ladyfingers and mascarpone I had sitting in my kitchen all this time. I’ve never had mascarpone before, and I like it. I really don’t know how to explain it. It has the creaminess of cream cheese but is more….cheese tasting. It’s definitely not sweet at all, which is why you often see it in desserts because it cuts the sweetness. Tiramisu literally translate into “pick me up” because it contains espresso. However, the espresso wasn’t very strong in the Pumpkin Tiramisu. In fact, the original recipe didn’t even call for it, but because I didn’t have any bourbon, I used espresso. Soaking the ladyfingers in maple syrup and espresso before assembly allows them to soften by the time you are ready to serve. For the sauce, I took pumpkin butter and mixed it with caramel sauce. Of course I encourage making your own (which I included in the recipe), but yes you can buy caramel sauce instead (seriously, just go make homemade, ok?). So um how does one make a pretty tiramisu? I mean look at mine. The ladyfingers on the right are sliding. I look at photographs then I look at mine and think I’m never photographing tiramisu ever again. 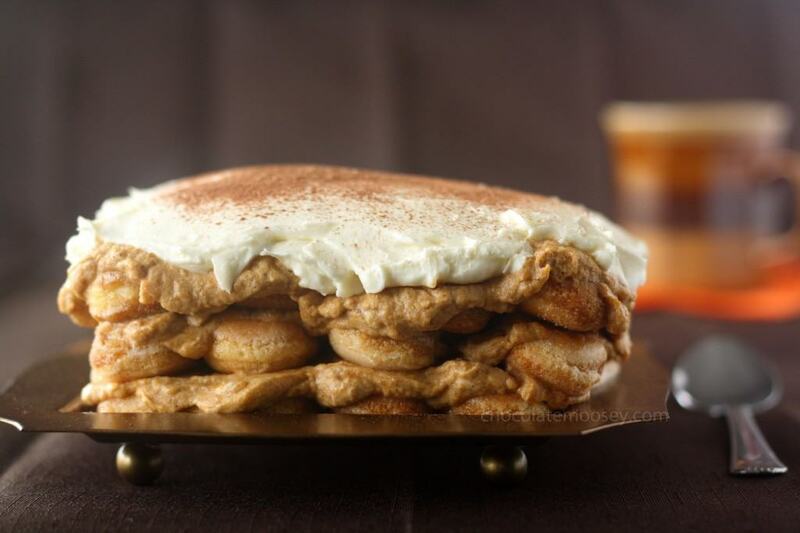 I will, however, be making this Pumpkin Tiramisu With Pumpkin Butter Caramel Sauce again. 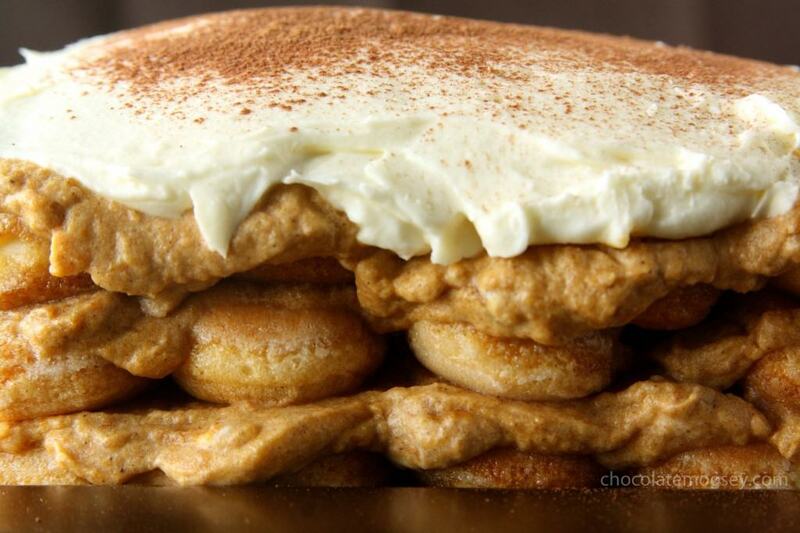 You have the sweetness from the pumpkin filling balanced out by the tangy mascarpone topping. Dust some cocoa powder on top for some bitterness. In a medium bowl, beat 1/3 cup cream until it begins to thicken. Gradually add the sugar and continue beating until soft peaks form (this means when you pull the beater(s) straight up, peaks will form but the tips will bend). Set aside. In a medium bowl, combine the pumpkin, cinnamon, clove, ginger, and salt. Fold in the whipped cream. Set aside. In another medium bowl, beat together the mascarpone, powdered sugar, and remaining 1/3 cup cream until thickened and smooth. Set aside. In a small saucepan, bring the water to a boil. Remove from the heat and whisk in espresso powder and maple syrup. Place the espresso mixture into a bowl wide enough for dipping. Dip 4 ladyfingers into the mixture, coating both sides. Arrange them in a row next to each other on a plate or in a pan (if using a pan, you may need to do two layers of ladyfingers with 6 in each row). Spread 1/3 of the pumpkin mixture on top of the ladyfingers. Dip another 4 ladyfingers into the espresso mixture and make another row. Spread another 1/3 of the pumpkin mixture on top. Dip the remaining 4 ladyfingers and arrange on top. Spread the remaining pumpkin mixture on top then top with the mascarpone layer. Dust with cocoa powder. Cover and refrigerate for at least 8 hours or overnight. For the caramel sauce: In a deep saucepan, spread granulated sugar in an even layer. Cook over medium heat, watching it carefully until it starts to turn an amber color. Remove from the heat. The sugar keeps cooking, so don’t let it get too dark or it will be burnt by the time you are done. Slowly whisk in half of the cream. Be careful because it will bubble up. When it dies down a bit, finish whisking in the rest of the cream then whisk in salt. If the sugar hardens, place the pan back over low heat and stir until it softens again. Strain into a bowl. Whisk in the pumpkin butter. Pour on top of tiramisu when serving. Refrigerate any leftovers. I don’t get it – these photos do a GREAT job at making me run to the store and buy more ladyfingers to try this version. ;) But it IS annoying when one does something that tastes great and sometimes it just won’t show on pictures. Which is NOT the case here. I sure do love your brown tiramisu! The pumpkin caramel sauce is my favorite part, never mind the color! Have a great sunday Carla! Oh Carla – this looks amazing! Wishing I had a big plateful right now! Thank you so much for joining in this week! WOW!!! Looks and sounds simply amazing. That looks like it would just melt in my mouth! you’re photos are just cruel. My fork just bounces off the computer screen when I try to get just a little bite! 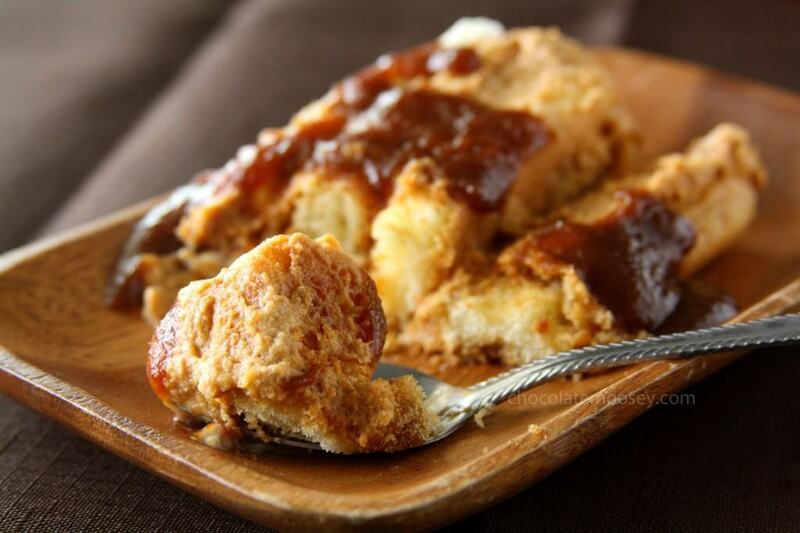 Your caramel sauce puts this over the top! Oh my goodness gracious, does this dessert ever look and sound amazing! Want want want!!! This looks amazing, so decadent!! Oh my, all I can say is WOW!! Your pictures are so awesome too!! This is for breakfast, right? I can have it now? I really don’t know what you are talking about in regards to the tiramisu photos because yours are just fabulous. And it counts that an ingredient was orange, the final dish does not have to glow orange. I like the touch of the orange napkin in the background. Nice and subtle way to bring in the color. Girl, I think it’s beautiful. And I’d eat it all. By myself. And I wouldn’t apologize for it either. Carla – seriously! I don’t think anyone even noticed that it wasn’t orange. Beautiful presentation and I’m sure it’s out of this world! OMG I tried licking the screen it looked so good!!!! Super great idea! I don’t like tiramisu because of the coffee flavor so more pumpkin than anything sounds like a good deal to me! I can only dream of eating this, but dream I will! Gorgeous photos, as usual. No joke I was just looking for a Pumpkin Tiramisu recipe a week or so ago. This one looks FABULOUS! 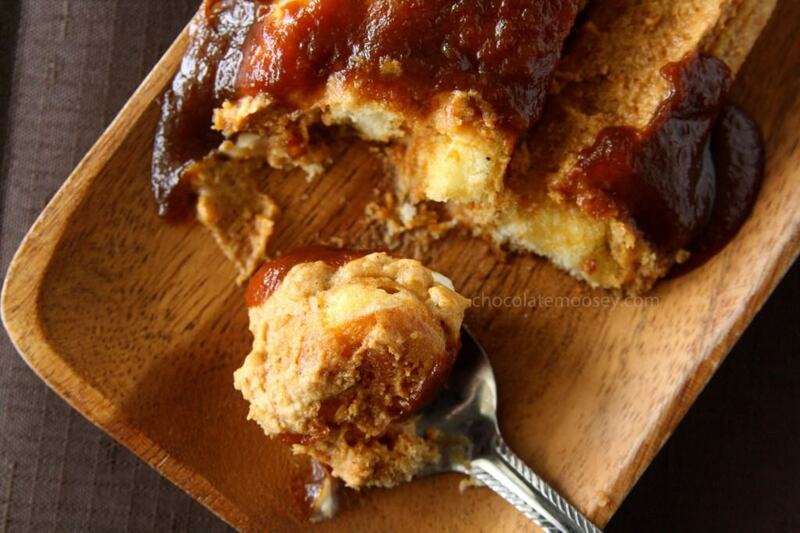 And that Pumpkin Butter Caramel Sauce … I want to just dip my finger in and not even worry about the rest of it. Okay. That looks AMAZING!!! I love everything about it, though (of course) my mind is stuck on bourbon, so I think I need to make it pronto. YUM. I think it looks pretty amazing… and certainly wouldn’t turn down a serving of it if you were to offer it to me… in fact, I’d probably ask for seconds! Carla, no matter what you think about the look or the color, I think this is stunning. And it makes me want to eat it right now! I just bought pumpkin butter at a farm stand so I got to try this! Seriously, this looks amazing, and I believe you outdid yourself with this amazing recipe. I can’t wait to try it. Your photos are stunning! Pinned. Wow, the lighting DOES make this look elegant! And delicious! Yum! 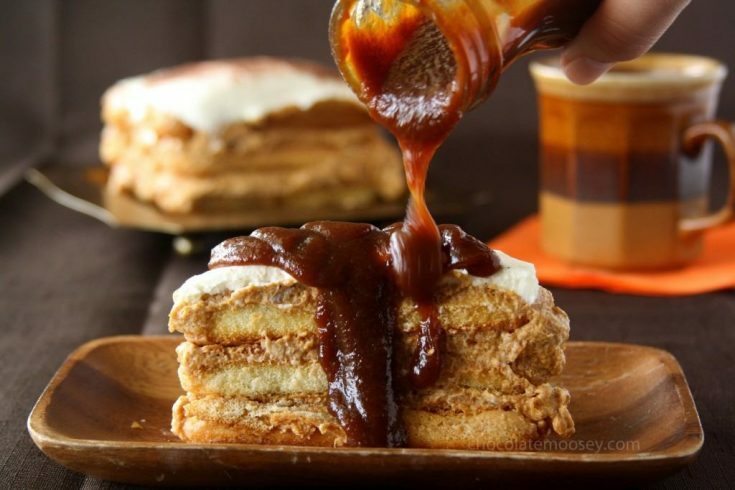 Okay, the caramel sauce being drizzled over the tiramisu – priceless! I’m drooling – seriously, drooling! This looks like some serious business!!! I’m having a moment looking at the caramel…………..yum! Beautiful!!! 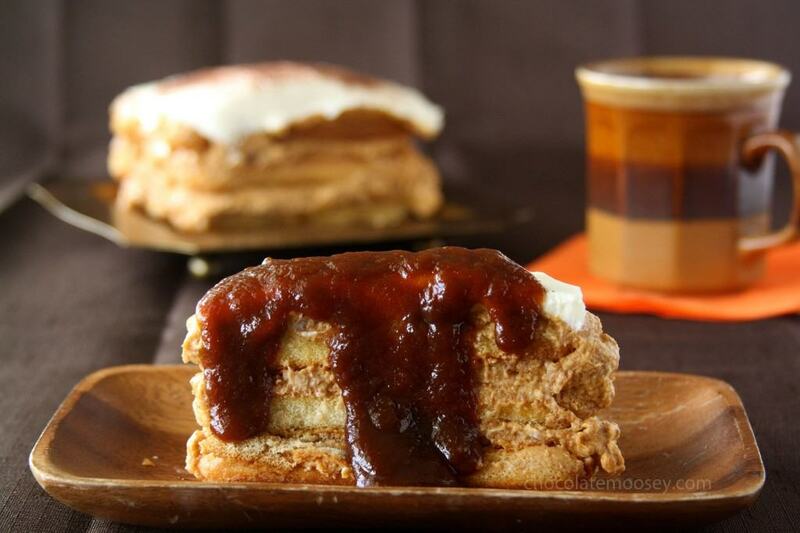 Love the homemade caramel sauce, yum! Holy YUM that looks amazing! Love the sauce dripping down too. I would be licking that plate shamelessly if you served it to me! This is absolutely droolworthy! 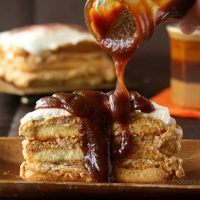 !I love tiramisu and this pumpkin version looks divine :)The caramel sauce just takes it to another level! Love tiramasu .. always buying the costco version:) This looks heavenly but not sure I’ll be able to pull it off :) but will be making the pumpkin caramel sauce which looks heavenly ! That I can do . Although if we do visit each sometime ( since we don’t live too far) will beg you to make me this creation ! beautiful pics as always ! WOW! I don’t care what color it is, this sounds amazing! I love tiramisu and pumpkin and pretty much anything salted caramel. 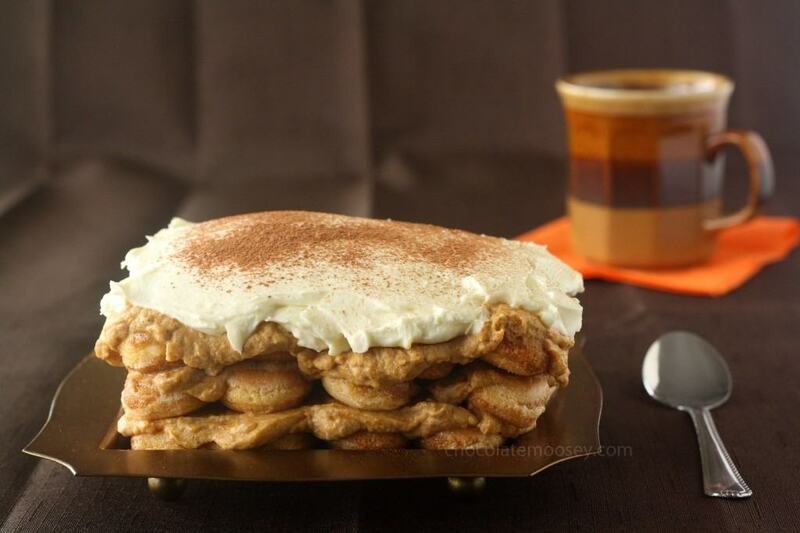 I have a recipe for an apple pie tiramisu with homemade lady fingers and homemade mascarpone that I found years ago and have yet to try it because I am so intimidated by making every component from scratch. I still may try one day, baking bucket list, but one thing I know I am totally putting this recipe on my list. 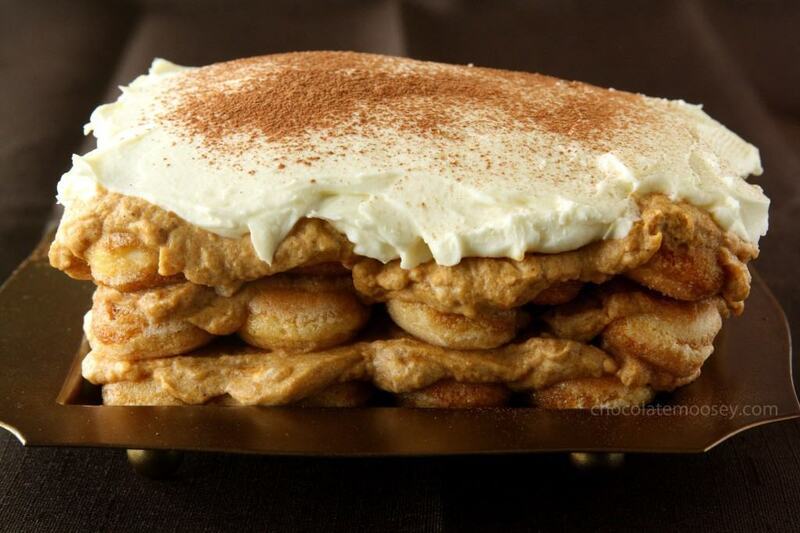 I may even make it for Thanksgiving this year – I don’t care for pie but I love cake and Tiramisu is close enough! Oh Clara, you made my mouth watery again. 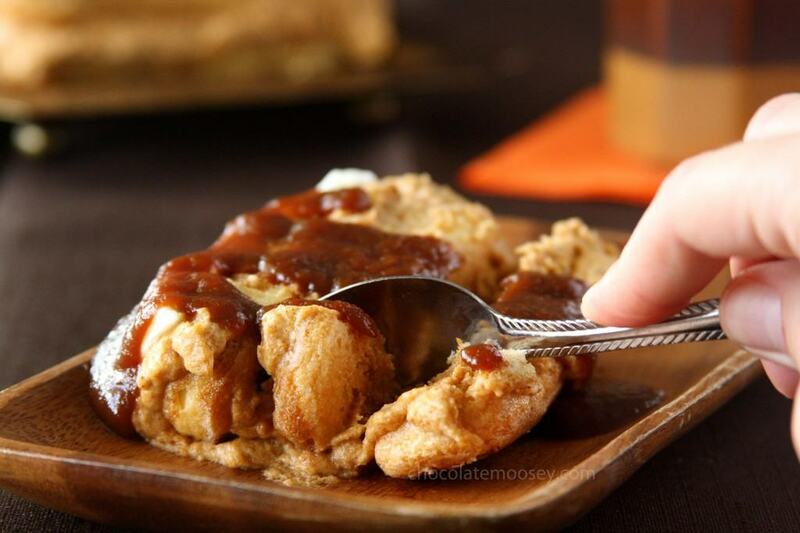 Great idea to use pumpkin for tiramisu and your caramel sauce texture looks so rich. We have a similar popular spread called “kaya” in Malaysia, which made from coconut milk, sugar and eggs. I think is time for me to change to your caramel recipe. Looks so good! Carla, your tiramisu is gorgeous! 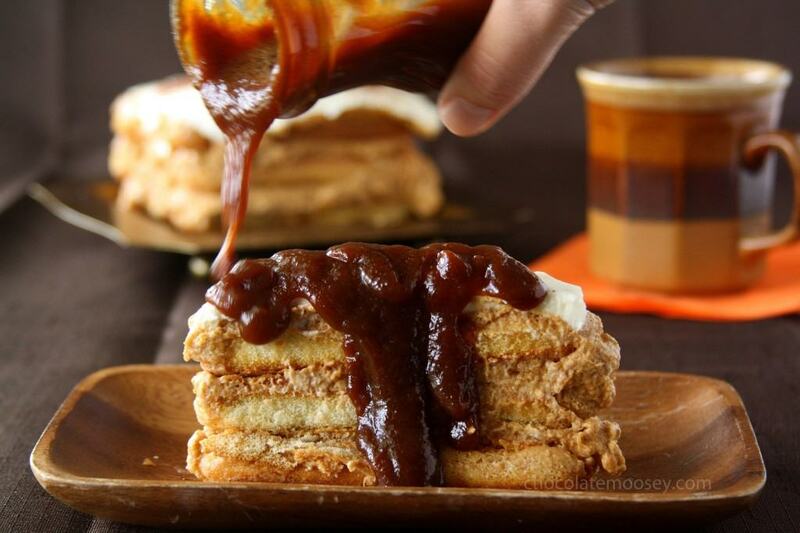 I want to lick my screen, especially the shots with that amazing pumpkin butter caramel drizzled over top. You constantly amaze me with your creativity and kitchen bravery (I mean, seriously?! Attempting to bake your own lady fingers? So awesome. And totally something I’d shy away from). Love this! Wholly, molly! My favorite ingredients in one treat ! Tiramisu and caramel! Just perfect! Actually there’s a setting called Continuous Shooting. As long as you hold down the shutter, it’ll keep taking pictures until you let go. Holey Socks! I think that first picture plum near made my hyperventilate! WOW!!!!!!! That looks SO amazing! I normally don’t care for tiramisu because I don’t like coffee, but I’m loving your version, also, I’m thinking perhaps the coffee flavor is a little less intense. Oh and the pictures ARE pretty! You had me at caramel. This is such a cool recipe Carla. So unique and innovative. OMG! Your tiramisu looks amazing!!!! Who cares if it’s brown?! It looks so good! I have always wanted to try to make this at home. . and now I will! thank you! Wow this dessert looks fabulous for Fall! Oh my goodness this looks amazing! 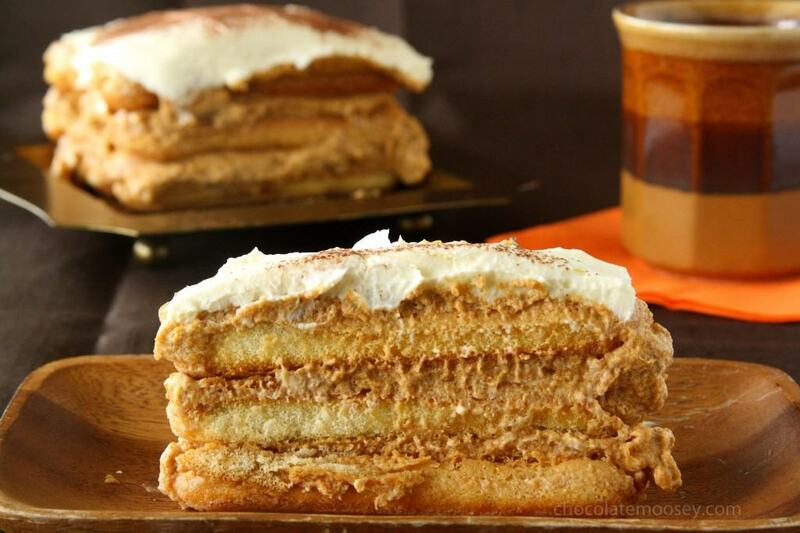 I love pumpkin and tiramisu but I never thought to put them together. Sister please! What are you trying to do to me over here! I’m oohing and ahhing over this! Thanks for the recipe! My teenage boys and hubby gobbled them up! They were the perfect treat before our 2 hour drive on Saturday morning.